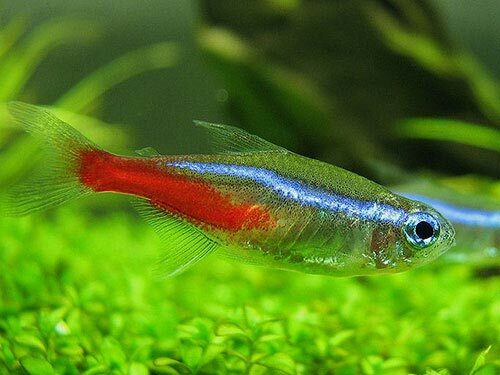 This article tells you about Tetra tutorial: Feeding and water quality. Most fishkeepers appreciate that water quality is the key to healthy aquariums. Fewer realise the important connection between diet and water quality, and how proper feeding can make it easier to maintain a healthy environment for our fish. 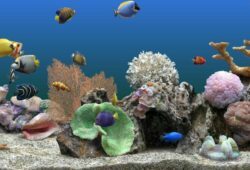 To understand the importance of food to water quality, it is useful to consider your aquarium as a system which has inputs, processes and outputs. For example, we put food into the aquarium (an input), which is then converted into fish growth and waste (processes). This waste may be further transformed by other processes (eg filtration and microbial breakdown) until it is eventually removed during water and sediment removal (outputs). Although processes alter the state of the inputs, ultimately if the inputs exceed the outputs, then there will be an accumulation of substances in the aquarium. This is why we talk so much about keeping the aquarium balanced – ensuring that we remove what we put in. The most important input is food. More fish means more food, and therefore more waste. This is why it is important not to overstock an aquarium. Overfeeding is also an issue because uneaten food will break down and contribute to total waste levels. Temperature is also important. 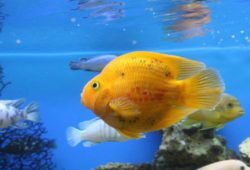 An overstocked aquarium may be fine at 24˚C/75°F, but if temperatures increase in the summer, then the fish will require more food and problems may occur. 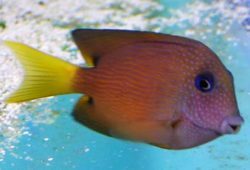 In the aquarium we have a mix of different species, different diet formulations and varying conditions. Therefore, it is important to observe fish at feeding time to ensure they consume all of the food within a few minutes. Aside from the quantity of food fed, its quality will also impact on water quality management. Broadly speaking, fish excrete solid and dissolved waste, both of which are affected by food quality. Solid waste, or faeces, represents the undigested portion of food plus some internal losses of old cells, mucus etc. The digestibility of a diet refers to how much is absorbed by the fish, and is usually expressed as a percentage. The structure and nutrient composition of different ingredients determines their digestibility, and this in turn affects the digestibility of the whole diet. Different fish species also vary in their ability to digest and absorb certain nutrients and the ingredients that contain them. Good quality foods will use high quality ingredients, along with appropriate processing techniques, to ensure a high percentage of the diet is digestible. This will reduce solid wastes. This is beneficial for water quality as solid waste consumes oxygen, releases dissolved wastes, and clogs equipment. Following the digestion and absorption of nutrients, they can then be used for a variety of different functions. Some will be used to build new tissues (muscle, hormones, enzymes, bone, cells of the immune system, etc) and some will be broken down to supply energy. Others, including certain minerals, will simply be excreted if absorbed in excess of the fish’s requirement. The two dissolved wastes of most concern to aquariums are nitrogen and phosphorus. The majority of nitrogen lost to the environment is excreted as ammonia. Ammonia is produced when amino acids are used for energy production. The body’s pool of amino acids originates from dietary protein and body tissues. While some of these amino acids will be used for building new proteins, some will be used for energy production. When amino acids are used for energy, their nitrogen-containing amino group is removed and converted to ammonium via a process called transdeamination. Ammonia is then predominantly excreted across the gills. Fish have evolved to make good use of protein as an energy source, so some ammonia production is inevitable. However, it can be limited through careful diet formulation. For example, fish require ten essential amino acids. If any of them are lacking, the process of building new body proteins will be hindered, and more of the amino acids will be excreted as ammonia. In addition, supplying alternative sources of energy (ie oil and carbohydrate) can help to reduce the need to use amino acids for energy. The overall digestibility of the diet is also important as a well-utilised food will supply more nutrition per gram, and therefore not need to be fed in the same quantities as a poorly used one. In most aquariums, ammonia production itself is not an issue as the filter should remove it. However, it will affect how rapidly nitrate accumulates, and this is of interest for algae control and sensitive fish species. Phosphorus, or at least its inorganic salts (phosphates), is of interest for algae control. It is an essential nutrient for fish, being involved in bone formation, DNA synthesis, and energy production. However, if absorbed in excess it will be excreted into the water. But not all of the phosphorus in fish food can be digested by fish, so faeces can be quite rich in this algae nutrient. The phosphorus in faeces will be broken down over time and released into the water, contributing to its total input. The choice of ingredients used in the diet will affect the amount of phosphorus available to the fish, as well as the total amount in the diet. For example, many plant ingredients are low in phosphorus, but up to two-thirds of it may be in the form of indigestible phytic acid. In animal ingredients the level of phosphorus is higher, and availability also tends to be better. However, regardless of ingredients used, the total amount of phosphorus in the diet tends to be higher than the fish’s actual requirement, as only a portion can be digested. Of more immediate impact than undigested phosphorus are dissolved inorganic phosphates excreted by fish. These are directly available for algae to use, and are excreted when an excess of phosphorus is absorbed into the body. Therefore, the objective of a good-quality food is to supply just enough phosphorus to meet the fishes’ requirements. This way, while some faecal phosphorus losses are inevitable, losses of dissolved phosphates should be minimised. The future of fish food technology is about minimising waste production, whilst ensuring the fish still receive the best possible diet. Patented Crisp technology from Tetra is designed to do just this, using a unique processing technique to improve nutrient use and reduce solid and dissolved waste production. In comparison to flakes, this is better for the fish and helps to improve the overall aquarium environment. This tutorial by Tetra was first published in the January 2007 issue of Practical Fishkeeping magazine.